Westland Aircraft was a British aircraft manufacturer located in Yeovil in Somerset. Formed as a separate company by separation from Petters Ltd just before the start of the Second World War, Westland had been building aircraft since 1915. During the war the company produced a number of generally unsuccessful designs, but their Lysander would serve as an important liaison aircraft with the Royal Air Force. After the war the company focussed on helicopters, and was merged with several other British firms to create Westland Helicopters in 1961. In 1915 the Westland Aircraft Works was founded as a division of Petters Limited in response to government orders for the construction under licence of initially 12 Short Type 184 seaplanes, followed by 20 Short Type 166 aircraft. 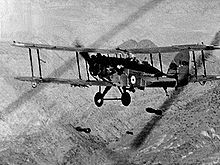 Orders for other aircraft followed during the First World War, including the Sopwith 1� Strutter, the de Havilland designed Airco DH.4, Airco DH.9 and Airco DH.9A and the Vickers Vimy. The name "Westland" was chosen by Mrs Petter as new land purchased as part of an expansion in 1913 at West Hendford which had been earmarked for a new foundry, but ended up becoming the centre for aircraft production. As a result of the experience gained in manufacturing aircraft under licence, Westland began to design and build its own aircraft, starting with the Westland N.1B in 1917, which was followed in 1918 by the Wagtail and the Weasel. Following the end of war, Westland produced the Limousine and Woodpigeon light aircraft for the civilian market, but most successful was the Wapiti close support aircraft. In 1935 Petters split its aircraft manufacturing from its aircraft engine concerns to form Westland Aircraft Limited, based in Yeovil, Somerset. The Whirlwind was the UK's first cannon-armed fighter and faster than many other British aircraft at the time but was troubled by the inability of Rolls-Royce to produce the engines. The Lysander army co-operation aircraft was displaced for reconnaissance as too vulnerable but found favour for specialist missions into occupied Europe carrying agents. Westland tendered designs for new aircraft during the war but only the Welkin was accepted. The Welkin was a twin-engine high altitude design to intercept attempts by high-flying German bombers to attack Britain. When the threat never appeared production was limited. For much of the war their factories were used to build Supermarine Spitfires, after the Supermarine factory in Southampton was bombed out of action during the Battle of Britain, indeed Westlands built more Spitfires than any other manufacturer. Westland would then go on to be the major designers of the Supermarine Seafire, a navalised conversion of the Spitfire. The Westland Wyvern was a post-war design of carrier-based strike-fighter for the Fleet Air Arm serving up to 1958. Post-war the company decided to get out of fixed-wing aircraft and concentrate solely on helicopters under a licensing agreement with Sikorsky. This upset W.E.W. Petter, the chief designer, who left to form a new aircraft division at English Electric that would go on to be very successful. Production started with the Sikorsky S-51, which became the Dragonfly, flying for the first time in 1948, and entering service with the Royal Navy and RAF in 1953. Westland developed an improved version the Widgeon which was not a great success. 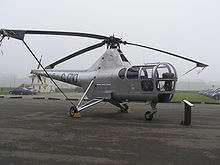 Success with the Dragonfly was repeated with the Sikorsky S-55 which became the Whirlwind, and a re-engined Sikorsky S-58 in both turboshaft and turbine engine powered designs as the Wessex. The chairmanship of Eric Mensforth from 1953-1968 marked the start of the transition, which was aided by the government when in 1959-1961 they forced the merger of the 20 or so aviation firms into three groups, British Aircraft Corporation and Hawker Siddeley Group took over fixed-wing designs, while the helicopter divisions of Bristol, Fairey and Saunders-Roe (with their hovercraft) were merged with Westland to form Westland Helicopters in 1961. Westland Dragonfly a license-built version of the American Sikorsky S-51. Westland Whirlwind a license-built version of the U.S. Sikorsky S-55/H-19 Chickasaw. Westland Widgeon a private venture by Westland Aircraft as an improvement on the Westland WS-51 Dragonfly. Normalair was created to continue the development and marketing of the pressure relief valves used in the Welkin project. James, Derek N. Westland: A History. Gloucestershire UK: Tempus Publishing Ltd, 2002. ISBN 0-7524-2772-5. Wings from the West: 40 years of Westland Flight 15 April 1955 by H. F. KING, MBE. Westland Aircraft Pictures and Westland Aircraft for Sale.